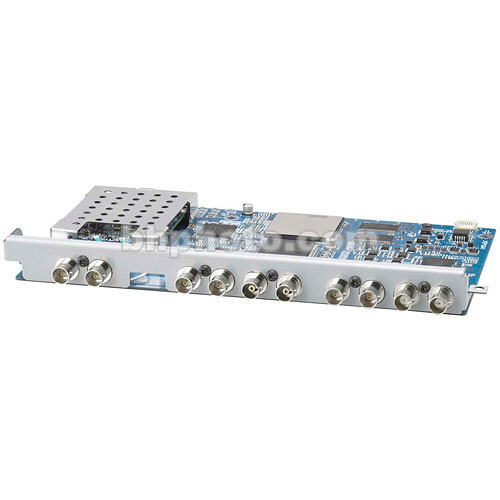 The DSBK-1820 HD Up Converter Board for the DSR-1800A and DSR-1600A DVCAM Master Series allows existing standard definition DV, DVCAM, and even DVCPRO users to bring standard definition material into the HD world with a minimal additional investment. Standard definition DV25 (miniDV, DVCAM, DVCPRO) recordings are easily up converted to either 1080i60/50 or 720p60. When installed in the DSR-1800A, a standard definition signal input to either the SDI or analog interfaces can be output via the HD-SDI interface. This is a must have addition to any DSR-1800A or DSR-1600A equipped post production or broadcast facility seeking to keep pace with the competition in the HD race. Easily up convert your standard definition by simply passing it through the DSR-1800A equipped with the DSBK-1820 and taking the HD-SDI feed out. Send your 1080i/60 and 720p/60 footage out over HD-SDI at 4:2:2 - great for extending the shelf life of archive material shot in standard definition. Squeeze, letterbox, or edge crop your footage in real time as it passes through the DSR-1800A equipped with this board. Box Dimensions (LxWxH) 15.6 x 8.3 x 2.7"